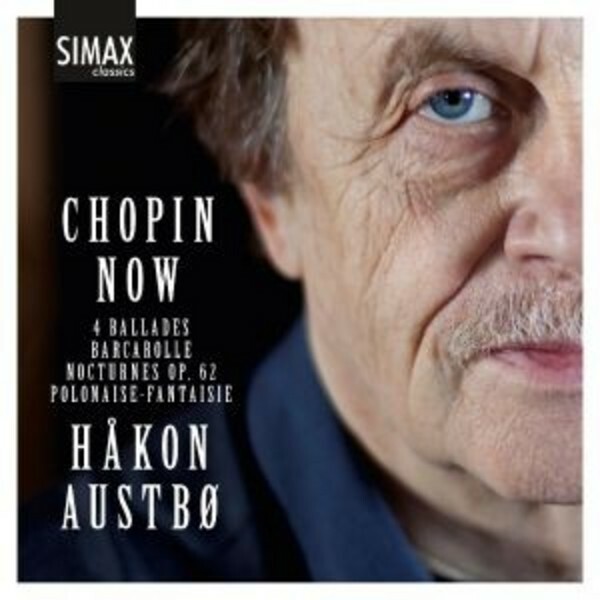 Norwegian pianist Håkon Austbø focuses on central works of Chopin’s late period in outstanding interpretations reflecting the composer’s intolerance of anything superfluous. The pieces Austbø includes on ‘Chopin Now’ are all great examples of Chopin’s extremely focused style. The composers he himself appreciated the most were Bach and Mozart, and a modern reading of Chopin underlines his polyphonic style of composition. He was an artist who remained to a large extent unaffected by external influences, working in solitude. According to Schumann, Chopin was the first to use the term 'ballade' about a piece of music without a text. The Four Ballades, which he worked on over 11 years, also represent something completely new in his output. In his late works Chopin follows his desire to broaden and lengthen unstable sequences on several levels. Likewise he creates expectations that are not fulfilled and cultivates the fragmentary, as in the Polonaise-Fantaisie. In his perceptive liner note, Olaf Eggestad makes a point of how Chopin’s late style is particularly relevant in our own times - where empirical knowledge and the poetic are not contradictions. Håkon Austbø has been active as a pianist at the highest level for over 50 years. His many recordings include, on Simax, the Scriabin Sonatas, Debussy’s Complete Works for Solo Piano, Messiaen’s Oiseaux Exotiques (he is a renowned Messiaen specialist), various contemporary pieces ranging from Elliott Carter to Rolf Wallin, and a duo recording of Franck, Poulenc, Debussy and Chausson with cellist Truls Mørk. The release of ‘Chopin Now’ coincides with the end of the immense research project ‘The Reflective Musician’, which Austbø has headed at the Norwegian Academy of Music. The project was aimed at the unveiling of forces which lead to genuine and personal interpretations of classical and contemporary works. This implied looking with fresh eyes at well-known repertoire, free from the ballast of tradition.